We’ve done PPV predictions before here as the Wrestling House Show, but I thought I’d change it up a little starting with this year’s Payback. Instead of predicting what I think will happen on the show, I’ll pretend to be the booker or writer or whatever and share what I think should happen. Or at least, what I would like to see happen based on what we’ve seen so far leading up to the PPV and where I’d like to see the stories go afterward. The change is small, but I think making predictions of what we’ll actually see can sometimes lead to negative attitudes towards stories that can clearly be seen going in directions I don’t care for. Predictions can lead to pessimism, and I want to keep things positive. It’s just wrestling after all, it should be fun! 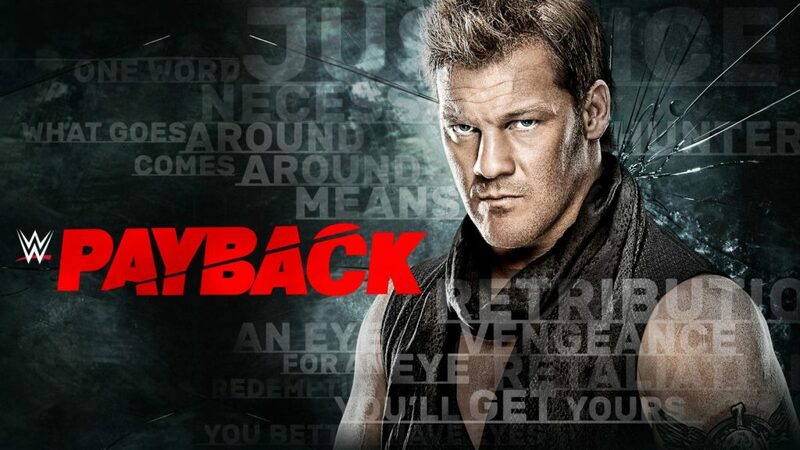 So with that, here is my armchair booking for the fifth annual Payback! Anderson and Gallows have gotten a raw deal since Wrestlemania. Adding the Hardy Boyz to the ladder match at ‘Mania, while fun for those of us watching, wasn’t fair to anyone else involve in the match, especially the champs. And yes, I realize they got a rematch and lost the night after Wrestlemania, but on that same night there was a number one contender match for the RAW tag titles which Anderson and Gallows weren’t involved in. The losers of that number one contender match were Enzo and Cass. I’d like to see Anderson and Gallows win this match as a way to begin to reassert their place in the RAW tag team division. Then, over the summer, they can rebuild their dominance which will lead up to a big match at Summer Slam for the titles against the Hardy Boyz. And by that time, The Revival should have been back in action for a while, so Anderson and Gallows can maybe feud with them leading in to Survivor Series. Or maybe a feud with Enzo and Cass for the titles since I think they’re probably due for a run like that pretty soon. I enjoyed their match on the Wrestlemania Kickoff, but I think this one will be even better. I’ve very much enjoyed the feud between these two, and I really like the addition of TJ Perkins (and to a lesser extent, Jack Gallagher) as a way to keep the interest level in this match high. Neville has been amazingly dominant in his current run, which I love, but I think it’s time to give him some weaknesses. Winning all the time is fine and can work for a character (e.g., Asuka), but I think some of the best champs have been built through overcoming adversity. I’d like to see Austin Aries win this match, then have Perkins become the next number one contender. Obviously Neville won’t be too pleased about that so his anger will reach a new (Neville) level, but he’ll still help Perkins defeat Aries for the title, probably on a 205 Live. Then Neville will destroy Perkins, taking back the title, which will directly lead to Perkins changing sides again and Aries facing Neville at Summer Slam for the title he was cheated out of. This is an interesting one. On the one hand, I think it’s too early for Alexa to just walk onto RAW and take the title from Bayley, especially since Charlotte, who has been so dominant, couldn’t do it. On the other hand, I don’t think Bayley should be able to just brush off Alexa’s challenge. I also feel that it almost seems inevitable that WWE is going to pit Bayley against Sasha at some point, probably in some misunderstanding-turned-feud scenario. I don’t really want to see that though. I like Sasha and Bayley as friends, though Sasha does seem overbearing at times. For this match, I’d like to see Alexa push Bayley to the limit, but for Bayley to come out as the winner. Have Alexa do something early in the match that puts Bayley off her game, like pull off some dirty trick that causes Bayley to look hurt, then have Bayley just manage to stick around until she can end the match with a rollup or something similar. This way Alexa looks strong, but it still allows her time to chase the title for a while. Even though it’s been short, I like the buildup for this match. There’s tension building just below the surface between these two teams, and I want to see it explode in this match. Something should happen in this match that causes Cesaro and Sheamus to go off on the Hardys. Have Cesaro and Sheamus start with some friendly competition, but about halfway through the match they get fed up and start beating on Matt and Jeff in pretty brutal fashion. In the end though, the Hardys will survive long enough to put together a burst of offense that will lead to the victory. Doing the match this way can extend the feud and lead to some hard-hitting matches between these two teams down the road. This is one of those feuds where I think the Superstar Shakeup hurts the match. I don’t really believe that Chris Jericho is going to be moved to SmackDown, so I don’t believe he’ll win this match. But I also think that Jericho’s current run in WWE is winding down, so you never know. It’s kind of like in The Walking Dead, when someone gets happy, then you can be pretty sure they’re about to die. In this case, Jericho has embraced the fans so much that I see him inching closer to the exit door of the figurative WWE arena. Regardless of all that, here’s what I’d like to see in this match. Kevin Owens should win. Derailing his “Face of America” thing right away would be a mistake. He should be one of the top guys on SmackDown, and this is a good way to start that road. And he already has his next opponent lined up with AJ Styles, the actual top guy on SmackDown. There’s no way they can’t go through with that match and turn it into the feud of the summer. This is probably the toughest call on the show. I think there are valid reasons for both guys winning this match. Rollins is coming off of beating Triple H at Wrestlemania and has great momentum, but Joe is still looking for that defining victory on the main roster. With that in mind, I think Joe should win this match. There are a few possible show-stealers on this year’s Payback, but I think this could easily be the most brutal match of the show. I think this should be the longest match of the night, and the most evenly contested. These two can have another match or two in the coming weeks or months to help even out the victories, but I think Joe needs this more than Rollins right now. Having these two guys bring the house down would do a lot for both of them, removing the specter of Triple H from both of their characters going forward. How do you promote a match when no one knows what that match is? How do you have a top-title champ on a show not defend his title when no top titles are being defended? How do you maintain interest in a feud when the two people involved were split to different shows and haven’t really interacted with each other since? I don’t know, but that’s what WWE did. I’m imagining something completely ridiculous and underwhelming for this match. Anyone remember the “Dungeon Match” between Owen Hart and Ken Shamrock? Back then I was imagining some creepy, underground area with chains and dripping water, lit by a single bare light bulb that slowly swung from side to side, casting eerie shadows over every surface. What we got was a brightly lit, wood-paneled room. I’m not trying to belittle the match, upon reflection I think it was fine, but I’m just saying I was underwhelmed at the time. I feel like the same thing will happen here. I imagine a cross between a “Boiler Room Match” and a cheap haunted house. I expect more tricks like the projected images that were used at Wrestlemania. I expect a lot of moving from set-piece to set-piece at the detriment of a coherent match. But I’m getting negative now, aren’t I. What I would like to see is a return to the Bray Wyatt who didn’t care as much about winning as he did about messing up his opponent’s life. Randy Orton has to win this match, but I want Wyatt to do something that will cause Orton to hate himself for winning. Kind of like the traps from the Saw movies. No matter what you do, even if you “win,” you’ve lost in some way. Wyatt needs revenge for Orton burning down part of the Wyatt compound, and he needs to get it in this match. Is it time already for Reigns to knock over Strowman? Strowman has been on a tear over the last few weeks, and Reigns is physically and mentally beaten down. I think Reigns should put up a good fight, but Strowman should come away with the victory. Reigns has the excuse of still being injured after the attack from a few weeks ago, so losing to Strowman isn’t going to hurt his character. And losing here allows Reigns to regroup and come back stronger next time. Sorry I don’t have more for this one, but it’s the match I’m least interested in, and I think it’s the match with the least amount of intrigue. It’s just two big guys who are fighting to prove who is the bigger, tougher guy. So there you have it. That’s how Payback would happen if I were in control. As awkward as some of the promotion leading up to it has been because of the Superstar Shakeup and its proximity to Wrestlemania, I am looking forward to the show. I there’s a good possibility for a few really great matches, and some interesting strides can be made for some of the characters. Thanks for reading, and be sure to check Wrestling House Show after the show for my recap of what actually happened and what I thought about it all!